May Blossom – in good time. I had a quick look to see when we were talking about May flowers last year. 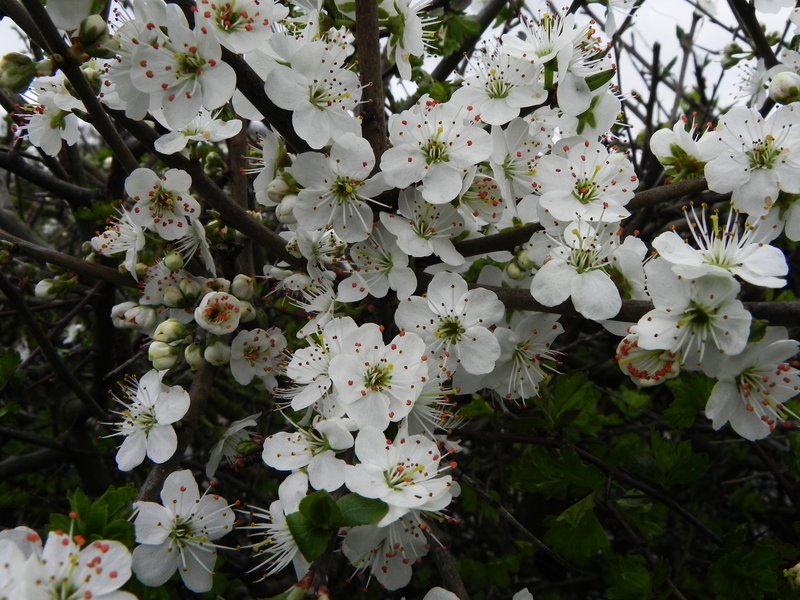 On May 29th we have a post welcoming the arrival of May Blossom at last. This year? Here it is only the 18th April and already the hedges are aglow with sheets of white. Is this a good omen? Is this a bad omen? Is this just weather? Well you might ask! As an aside our first mention of May Blossom the year before last (2012) was on May 11th. That must prove something. Luckily we needn’t concern ourselves with what. But that brings up a different issue. It’s still a couple of weeks (we have to fight our way through the Grand Cross in the Cardinal Signs first) until May Day or Beltane – Beltane was actually an all night party starting on the last day of April. May Day was more about the morning after. 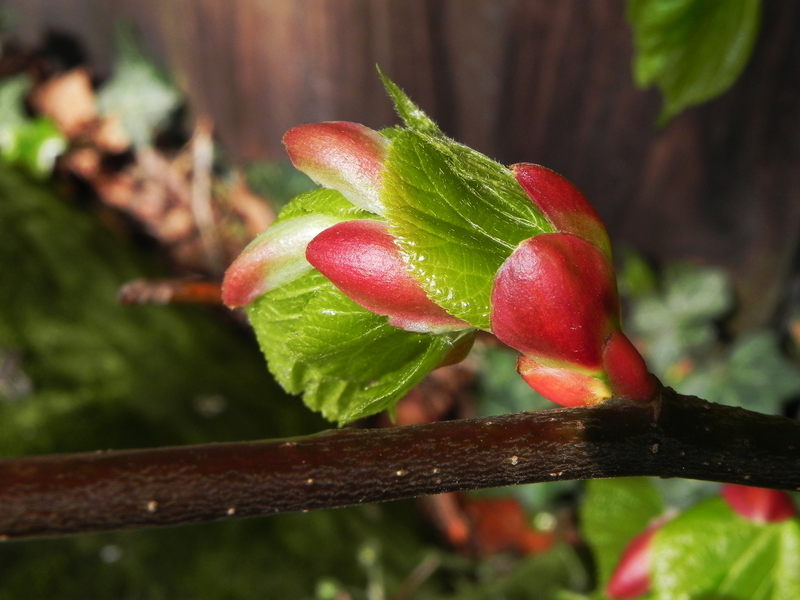 Of course, in the days when only the Romans bothered with months – they needed them to name after emperors – Beltane would be when the May Blossom appeared. It was when you turned the cattle out to pasture, but I digress. In those days it was common to have a May Bush. This could be a personal thing or it could be a community thing. A bush would be stuck up in a communal area and decorated with ribbons, flowers, shells and things – a bit like a Christmas tree. You can see the problem now though, can’t you? How can you weave all those patterns as you dance round a very prickly bush? Our current home is the top floor of a converted barn. Below us, the barn remains unconverted. The building is built into the hillside, so while our front door leads into a small lobby with stairs up to the main rooms of our home, the back door leads straight out to ground level a good way up the hill. From the back door you step onto a small flat-ish area of lawn surrounded by trees and bushes of various cultivated varieties. Behind that, the steeply rising ground is the home of oak, holly and the occasional beech tree with, at this time of year, a carpet of daffodils. Both the woods and the garden shrubbery are old established, possibly over a hundred years in the case of the woods. Over time, the shrubbery has climbed steadily up the hill and the woods have edged their way slowly downwards. Now, that terror of the spelling bee – the rhododendron, is from the Himalayas. For them, a steep incline is no deterrent. It seems to me that what is needed to keep them in check is some Himalayan local fauna. 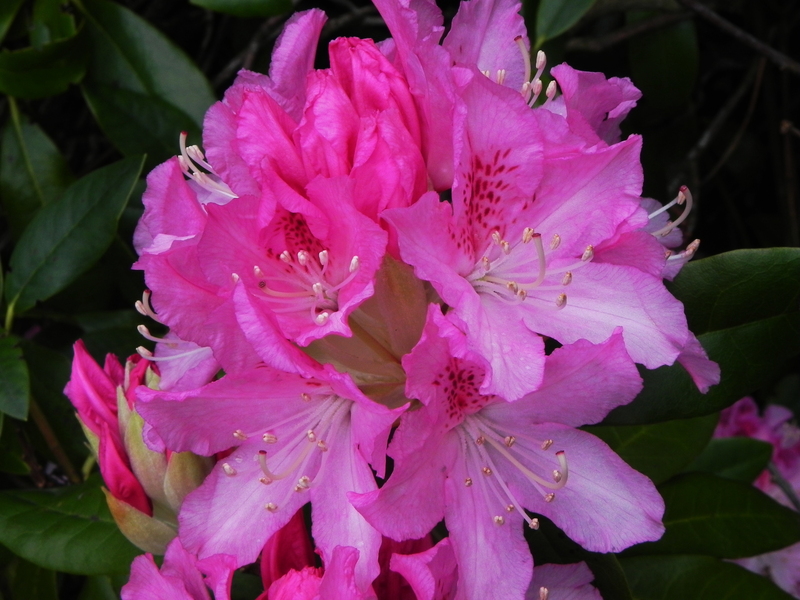 Honey made from the rhododendron pollen is toxic to humans. As anything with any semblance of human form is automatically drawn to consume everything that doesn’t actually kill them very often, and lacking any clear evidence to the contrary, I feel justified in assuming that that denizen of desolation, the Yeti, must exist on a diet of rhododendron flowers. We’re hoping he’ll pose for a photo when he turns up – watch this space. Each year, about this time the cherry trees blossom. Cherry blossom means Japan, of course. In Japan they are in two minds about it. The arrival of the cherry blossom heralds the arrival of the hay fever season. 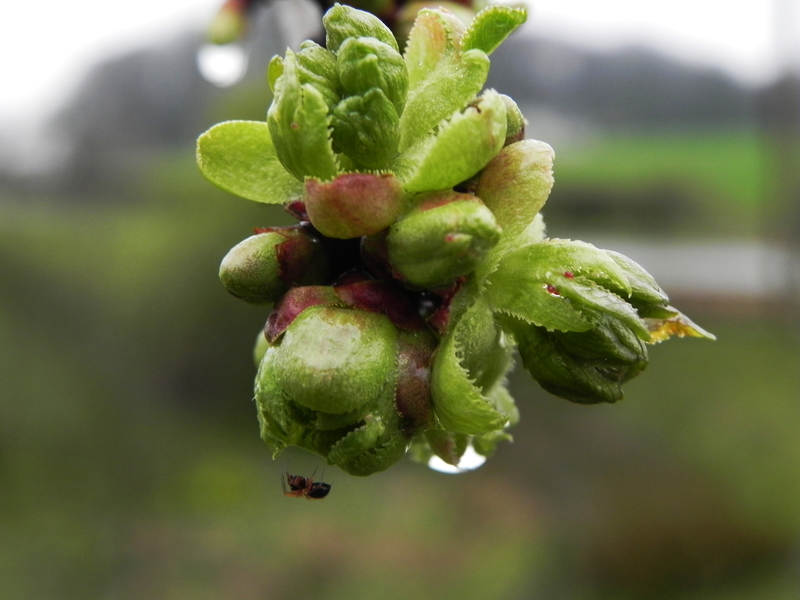 While the cherry blossom is the most obvious culprit, it isn’t the main source of the pollen. Most comes from the Japanese Cedar and Japanese Cypress trees that were planted in their thousands as part of the reconstruction and rebuilding programme after the war. The pollen from these two trees is maximised once the tree reaches the ripe old age of thirty. Most of the trees are now thirty to forty years old and well into the swing of it. At this time of year a range of ‘anti-hay fever’ products appear – after all, on a nice day who wouldn’t want to picnic in the park amongst the cherry blossom. This year, the most popular seems to be a sort of bee keeper helmet, with a small battery powered fan in the top that draws in air through a filter. I presume that the air in Japan, realises that it isn’t supposed to come in through the gauze covering your face, and makes its way round to the fan independently – perhaps there are signs showing the correct path. Our cherry trees, down by the beck, are doing their best. Every time we pass that way we stop and have a chat. Obviously, we’re concerned that all these negative vibes may put them off. We’ve taken to passing on those ‘inspired quotes’ that litter the Internet every time we’re round that way. Today we tried ‘It doesn’t matter if the glass is half full or half empty – as long as you have a glass with something in it’. I’m not sure if it hit the spot, though.